Bishop Harper said it was "time to move on"
The ban on Catholics becoming the British monarch should be abolished, according to the incoming Church of Ireland primate. In an interview with the Irish Times newspaper, Bishop Alan Harper said it was now time to "move on". The Act of Settlement bans Catholics, or those married to Catholics, from ascending the British throne. 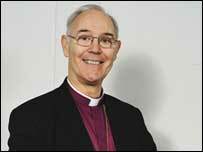 Bishop Harper, who was born in Tamworth in Staffordshire, is to succeed Dr Robin Eames who retired in December. The new primate-elect said the Act of Settlement of 1701 "belongs to its time and we should move on", but that its repeal could have implications for the Church of England. As well as being the head of state, the British monarch is governor of the Church of England. Bishop Harper told the Irish Times that the disestablishment of the Church of England - separating church and state - was something it would "not only get over, but would be the better for it". In the past, the head of the Catholic Church in England and Wales, Cardinal Cormac Murphy-O'Connor, said under the act's terms, Prince William "can marry by law a Hindu, a Buddhist, anyone, but not a Roman Catholic" and still be king. The relevant part of the Act states: "That all and every person and persons, who shall or may take or inherit the said Crown, by virtue of the limitation of this present act, and is, are or shall be reconciled to, or shall hold communion with, the See or Church of Rome, or shall profess the popish religion, or shall marry a papist, shall be subject to such incapacities."